EdgeRank, Facebook‘s Newsfeed algorithm is a bit of a riddle to all of us, and we constantly try to understand it in order to succeed on the platform. It is of paramount importance to understand EdgeRank as a “logic” as well as a sum of its parts. Today I will be looking at the “three pillars” of EdgeRank and what each of these means to our Facebook strategies. Of course each of us might interpret things a little differently, yet the general idea will in doubt remain the same. Here goes. Let’s take a look at each pillar. Affinity is “the score between the viewing user and the edge creator”. It is determined by a user’s interest in your content, by weighing in interaction with your page. Facebook wants to show its users relevant content that they will be engaged with, so, it needs to measure how “close” their interests are to what you’re offering them. Everyone knows, that if a post is well-liked, it will get a lot of organic reach. Yet, a post is only shown to someone because of their affinity to it in combination with the other two ranking factors. EdgeRank ranks posts according to Affinity, Weight & Decay. Do you know what this means? Weight is “the weight for the edge type (Comment, Like and Share)”. It’s no lie – Facebook prefers certain post types and gives precedence to them. Videos and photos are top priority. It’s no surprise though, considering that they are two most engaging post types. Video on Facebook is gaining momentum very naturally, and shows great promise, especially since technologies like Virtual Reality are really starting to bloom. So, Facebook will weigh different post types differently, based on their EdgeRank weight. #Facebook will weigh different post types differently, based on their EdgeRank weight. Decay is “based on how long ago the edge was created”. Posts have a natural “expiry date”, and so older ones are less likely to show up in someone’s News Feed. Reach will increase and then slowly decrease as a post ages. During this time, it is the combination of decay, affinity and weight of any particular post that can swing things either way. This is why it is so important to post at the right time for your audience. Your post needs to be “fresh” when all relevant users are online. 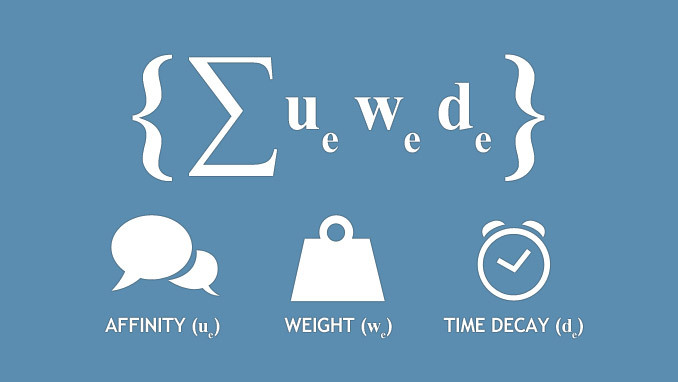 So, if one was to visualise the equation that is EdgeRank, what does it look like? This. Ranking is always based on a calculation of the relationship between each element. So, when it comes down to optimising your Facebook Page’s content and ultimately help you to be successful with your audience, you will need consistency to get people who “like” your status updates to keep on liking it in order to score high affinity. It’s a simple idea, that content that is receiving little or no interaction is less likely to appear in anyone’s News Feed. To get people to like your content, you need to see what type of posts they interact with. Photos, links, and videos have totally different engagement rates – Anyone who tests different post types on their Facebook pages will attest to this. In any case, if a specific user likes more links than photos, more links will appear in their News Feed. Negative feedback will affect EdgeRank as well, so make sure you take this into consideration. If something receives negative feedback there’s no point repeating it. Increase your post’s ranking on NewsFeed by optimising them to counteract decay over time! A lot has been said about the timing of a post that will cause it to rank higher. Post decay can be counteracted as long as a post is being interacted with through likes, shares, etc. It’s highly important though, to optimise the timing of our posts because counteracting decay is an uphill struggle. In any case, we should try to increase organic appearance of our posts by making sure they are well-timed, relevant, and of the right post type.